PVMBG reported that during 1 January-15 June gas plumes from Makian rose no higher than the crater rim. Seismicity fluctuated but decreased overall. On 16 June the Alert Level was lowered to 1 (on a scale of 1-4). Makian remained in repose as tectonic earthquakes striking the region preceded a cluster of volcanic earthquakes during May and early June 2009. Makian lies SW of the S-central portion of Halmahera Island (in the province of Maluku Utara). Some local residents refer to the island as Mt. Kie Besi; however, it is better known under the name of Mt. Makian (other variants include Kie Besi, Makjan, Makyan, and Wakiong). The last eruption of Makian occurred in 1988 (SEAN 13:07, 13:08, 13:10, and 13:11) and created a volcanic dome or plug on the crater floor with a diameter of 600 m and volume of ~ 282,600 m3. The 1988 eruption led to the temporary evacuation of the island's 15,000 residents (SEAN 13:07). Not previously discussed in the Bulletin, the TOMS image archive shows several SO2 clouds from the 1988 eruption (during 30 July-5 August 1988) as well as visible and infrared imagery (Sawada, 1994). The following information was translated from a Center of Volcanology and Geological Hazard Mitigation (CVGHM) report dated 17 July 2009. Authorities raised the hazard status on 2 June 2009 (from normal, Alert Level 1 to 2) due to the following seismic and other observations. The pattern of earthquakes and tremor, high for most of May 2009, decreased rapidly after the 28th (table 2). Hot explosions continued until at least mid-June from sulfurous vents on the S side of the lava dome. Emissions from these vents were off-white, with weak pressure, and they fed a plume reaching ~ 10 m above the peak. Table 2. Seismicity recorded at Makian during 1 May-3 June 2009. Courtesy of Center of Volcanology and Geological Hazard Mitigation (CVGHM). An increase in tectonic earthquakes in the Maluku Utara (N Moluccas) region preceded the increased activity at Makian. No recent morphological changes have been observed. Based on observations up to 30 June 2009, the hazard status was downgraded to Alert Level 1 on 16 July. However, authorities still prohibited people from climbing to the peak. The MODVOLC system had no recorded thermal alerts from Makian from at least the beginning of 2000 through August 2009. Reference. 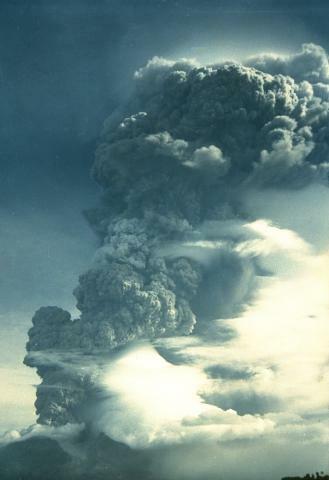 Sawada, Y, 1994, Tracking of Regional Volcanic Ash Clouds by Geostationary Meteorological Satellite, in Volcanic Ash and Aviation Safety: Proceedings of the First International Symposium on Volcanic Ash and Aviation Safety, edited by Thomas J. Casadevall, U.S. Geological Survey Bulletin 2047. PVMBG reported that seismicity at Makian increased at the beginning of January and was characterized by deep volcanic earthquakes, low-frequency events, and tremor. Tremor amplitude increased at the beginning of March. Gas emissions did not change; weak solfatara emissions continued to rise from the crater floor. The Alert Level was raised to 3 (on a scale of 1-4) on 7 March. Residents and tourists were reminded not to approach the crater within a radius of 1.5 km. CVGHM reported that on 16 July the Alert Level for Makian was lowered from 2 to 1 (on a scale of 1-4) because no visual changes or increased seismicity were noted. Residents and tourists were not permitted to climb Makian. CVGHM reported that during 28 May-2 June seismicity from Makian increased, particularly the occurrence of tremor. Little, if any, increases in emissions were seen. The Alert level was raised to 2 (on a scale of 1-4). VSI stated that last week's report of volcanic activity at Makian on 16 August was false. An observer mistook the glow from a bush fire as volcanic activity. An eruption began at Makian on 16 August at 1930. During the eruption, chunks of incandescent lava were ejected 75 m through the air. Residents were evacuated to the S side of the island. The volcano is at Alert Level Red. NOTE: VSI has since reported that this eruption is likely to have been a bush fire. We are seeking more information. The Jakarta Domestic Service reported on 13 June that "the Social Affairs Dept. has designated Malifut County in Kao Subdistrict, North Maluku District, as a resettlement area for 3,250 families being evacuated from Makian Island, because there is a possibility that the volcano on the island will erupt at any time." Information Contacts: Jakarta DRS, Jakarta. Fears of renewed activity at Makian, which last erupted in 1890, stemmed from earthquakes felt in the area in 1972. Investigations carried out between January 1973 and July 1976 by GSI volcanologists indicated that the earthquakes recorded were of tectonic origin and that the volcano shows no signs of renewed activity. Information Contacts: G. de Néve, GSI, Bandung. Smaller explosions continued until early August, then activity steadily decreased. Weak emissions of white steam reached more than 100 m above the crater rim during August. About 17 volcanic and seven tectonic earthquakes were registered daily. New data from Japan's GMS satellite.... An image at 1200 on 29 July (figure 1) shows a dense plume with a surface temperature of -70°C (figure 2), suggesting an altitude of 15.2 km (table 1). Table 1. Analysis of GMS satellite data by Yosihiro Sawada, with parameters of the 29 July Makian plume and possible eruption clouds on 31 July 1988. By the time of the next image, three hours later, the plume was detached from the volcano and was noticeably more diffuse. Possible volcanic plumes were also detected on GMS imagery returned 31 July (figures 1 and 3), but no ground reports of large eruption clouds are known at those times. Figure 3. Temperature gradients in the clouds shown in figure 1. Makian is marked by a solid triangle. Courtesy of Y. Sawada. Information Contacts: Y. Sawada, JMA. . . . . The number of shallow volcanic earthquakes began to increase sharply on 20 July. Based on seismic and visual data, VSI anticipated that an eruption would begin within two weeks, and the 15,000 residents of Makian Island were evacuated to Moti Island, ~6 km to the N.
On 28 July, 521 seismic events were recorded, and tremor began . . . at 2200. The eruption started the next morning at 1112 with a continuous thunderous explosion that was clearly heard on Moti Island. A dark ash cloud reached 8-10 km height. On 30 July at 1006, an explosion was followed by nuées ardentes that advanced E (along the Ng. Powate valley) and N (Ng. Para valley). Originating from ~1,200 m asl, the nuées ardentes descended to 250 m altitude, and some finally reached the sea. A series of smaller explosions began on 31 July and continued until 6 August, feeding ash columns that decreased from 6 to 1-2 km above the crater. As of the first week in December, white fume was still rising weakly from the crater. Seismicity continued to decrease, with 17 tectonic and 14 volcanic earthquakes recorded 1-7 December. Makian was falsely alleged to have begun erupting at 1930 on 16 August 2001. The same Jakarta news article also reported that the volcano continued to spew lava on 17 August forcing residents to evacuate. The article also noted that hot ash and debris were ejected to a height of 20 m and dark clouds rose 75 m.
The Volcanological Survey of Indonesia (VSI) later indicated that the report was false. An observer had mistakenly interpreted the glow from a brush fire as volcanic activity. VSI has not reported any recent volcanic activity at Makian. Information Contacts: Dali Ahmad, Volcanological Survey of Indonesia (VSI), Jalan Diponegoro No. 57, Bandung 40122, Indonesia (URL: http://www.vsi.esdm.go.id/). ; Darwin VAAC, Bureau of Meteorology, Northern Territory Regional Office, PO Box 40050, Casuarina, Northern Territory 0811, Australia; Meteorological and Geophysical Agency of Indonesia (Badan Meteorologi dan Geofisika, BMG), Jalan Angkasa I/2 Kemayoran, Jakarta Pusat 10720, Indonesia (URL: http://www.bmg.go.id/), Société Volcanologique Européenne. Makian volcano forms a 10-km-wide island near the southern end of a chain of volcanic islands off the west coast of Halmahera and has been the source of infrequent, but violent eruptions that have devastated villages on the island. The large 1.5-km-wide summit crater, containing a small lake on the NE side, gives the peak a flat-topped profile. Two prominent valleys extend to the coast from the summit crater on the north and east sides. Four parasitic cones are found on the western flanks. Eruption have been recorded since about 1550; major eruptions in 1646, 1760-61, 1861-62, 1890, and 1988 caused extensive damage and many fatalities. Matahelumual J, 1986. G Makian. Bull Volc Surv Indonesia, 110: 1-37 (in Indonesian). There is no Deformation History data available for Makian. 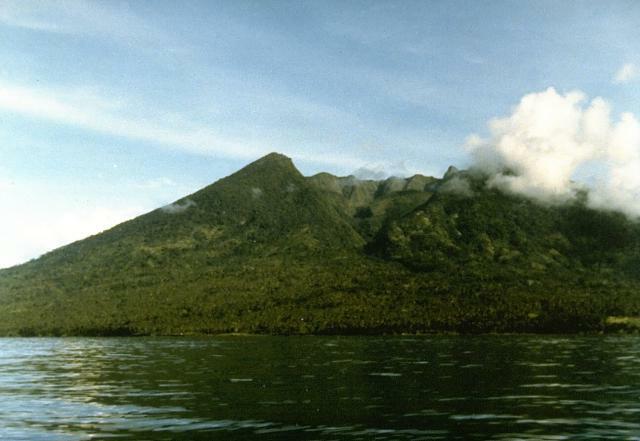 Makian volcano, one of a chain of islands off the western coast of Halmahera Island, has been the source of infrequent, but violent eruptions that have devastated villages on the 10-km-wide island. The large summit crater containing a small crater lake on the NE side is drained by two steep-walled valleys. The northern valley, Barranco Ngopagita is seen in this view from the NW. A vigorous eruption column rises above Makian volcano in this 1988 view from neighboring Moti Island. The six-day eruption began on July 29, producing eruption columns that reached 8-10 km altitude. Pyroclastic flows on the 30th reached the coast of the island, whose 15,000 residents had been evacuated. A flat-topped lava dome was extruded in the summit crater at the conclusion of the eruption. 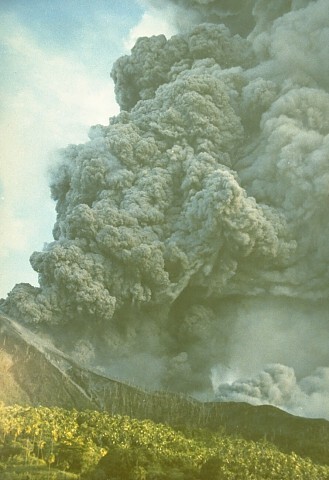 Photo by Willem Rohi, 1988 (Volcanological Survey of Indonesia). 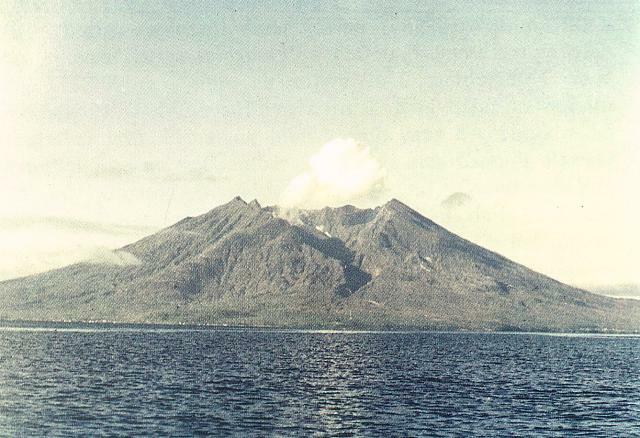 A vigorous eruption column rises above Indonesia's Makian volcano in this July 31, 1988, view from neighboring Moti Island. The six-day eruption began on July 29, producing eruption columns that reached 8-10 km altitude. Pyroclastic flows on the 30th reached the coast of the island, whose 15,000 residents had been evacuated. A flat-topped lava dome was extruded in the summit crater at the conclusion of the eruption. Makian volcano forms a 10-km-wide island near the southern end of a chain of volcanic islands off the western coast of Halmahera. The northern of two prominent valleys that extend from the summit is prominent in this photo. The large 1.5-km-wide summit crater containing a small lake on the NE side gives the 1357-m-high peak a flat-topped profile. Violent eruptions from Makian volcano, also known as Kie Besi, have devastated villages on the island. Photo by Sumaryono (Volcanological Survey of Indonesia). The Global Volcanism Program has no maps available for Makian. There are no samples for Makian in the Smithsonian's NMNH Department of Mineral Sciences Rock and Ore collection. Large Eruptions of Makian Information about large Quaternary eruptions (VEI >= 4) is cataloged in the Large Magnitude Explosive Volcanic Eruptions (LaMEVE) database of the Volcano Global Risk Identification and Analysis Project (VOGRIPA).